Or call 777-Junk to make an appointment. Fast and Simple. Free Estimates Quick! Watch this short video to see us in action! 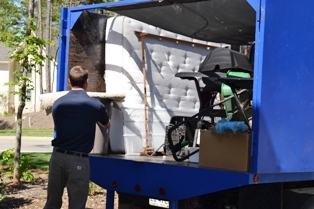 777-JUNK is a full-service junk removal company serving Western North Carolina. We help you get rid of the things you no longer need or want and we do all of the lifting, loading and cleanup from wherever the items exist. Whenever possible, we recycle or donate useful items you no longer need. You may have seen our blue trucks all over the area. It's hard to miss! Our blue trucks are the one thing that most people remember us with, right after our 777-JUNK phone number. Local Asheville business owners Joe Capel and Scott Brown have built 777-JUNK into the wildly-popular junk removal service that we are today. The traditional concept of hauling junk from customer's homes and businesses is not a new idea. But the way that we offer our service and work with our customers is the real magic to 777-JUNK! 777-JUNK is a full service junk removal business. As Joe explains, “Just show us what needs to go, and we’ll take it out. It doesn’t matter if it’s in the attic, basement, or outside. We remove everything from old furniture, appliances and electronics to swing-sets, swimming pools, and exercise equipment”. We also work hard to recycle, repurpose or donate as much as possible to limit the impact on our local landfills. It’s good for our business, but more importantly, it’s good for the environment and our community. At our very core, we are a service company. Every one of our employees is trained to arrive on time, be courteous and respectful of our customer's property, and to deliver a level of service that is beyond the "norm". We book appointments in two-hour arrival windows and we’ll call ahead 15-30 minutes to let you know we’re on the way. When we arrive, you simply show us the items you want removed and we’ll review the pricing with you and give you a clear estimate up front. With your approval, we’ll start work immediately. Book online now or call 777-Junk! What's going on in western NC. © 2011 AllJunk, LLC. All rights reserved.